Cllick HERE to enter my Blog Candy! Hello! It's time for a new challenge at Your Next Stamp, and this time the theme is~So Charming! We would like to see you use a Charm somewhere on your project! For my card, I used this super sweet image Tea Time Fhiona~Love her!!! The dp is some Bo Bunny Love Bandit and the sentiment comes from the PTI set All About You Additions. I also used some gorgeous Red Shimmer Satin Ribbon from Really Reasonable Ribbon. So would you like to see what you could win? 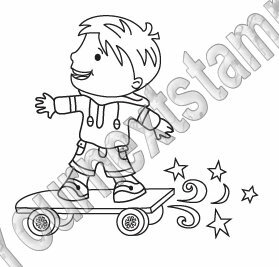 Yep, this cutie called Skateboard Dude is up for grabs! Remember, if you use a YNS image, you will be entered into the prize draw TWICE! Oh, you have done it again, I love your card girl! I almost used the same stamp this week, so glad I didn't, you made it rock! DARLING Kerri!! I LOVE it!! Such a CUTE image!! Hope our day is GREAT!!! Darling Kerri!! I just love your coloring of this sweet image, and your colors and design!! You always rock these images and this is no exception. I will miss being on the dt with you but you know we still have PP and I will stalk your blog gf!! AWWW Kerri girl this is FABULOUS, I LOVE these colors and your coloring of Fhiona is ADORABLE!!! BEAUTIFUL! This is such a cute image and your coloring is amazing. Thanks for sharing sweetie. Have a beautiful day. Adorable! I have some charms around here somewhere but I supremely stink at doing challenges! LOL I mean to do them but my laziness kicks in. Beautiful card Kerri! I love the cute image. Oh, what a sweet card! Love the heart charm here! How sweet, this is a darling GF card. Love the heart charm and the papers you've used are fantastic. Such a sweet card! !